Its fiber richness has to be highlighted, improving the intestinal transit. The potassium amount stands out from its mineral composition, and to a lower degree the magnesium and iodine. The range of its water-soluble vitamins is wide, without any vitamin standing out particularly. The amount of carotene though, is higher than in other fruits, giving the nectarine part of its diet/therapeutic benefits. The nectarine contains a higher amount of carbohydrates than peaches and it has a higher energetic value. Its fiber richness has to be highlighted, improving the intestinal transit. The potassium amount is outstanding, and to a lower degree the magnesium and iodine. The range of its water-soluble vitamins is wide, without any vitamin standing out particularly. The amount of carotene though, is higher than in any other fruit, giving the peach part of its diet/therapeutic benefits. The nectarine contains a higher amount of carbohydrates than peaches and it has a higher energetic value. Peaches have a higher amount of carotenoids, vitamin C and potassium. The provitamin A or beta-carotene is converted into vitamin A in our organism as needed. This vitamin is essential for our eye-sight, the optimum condition of our skin, hair, mucous membranes, and bones and for the correct function of our immune system, it also has an antioxidant action. The mineral Potassium is fundamental for the transmission and generation of the nervous impulse and for a normal muscle activity. It also helps to maintain the water balance inside and outside the cell. Its fiber richness is outstanding, improving the intestinal transit. As regards its mineral composition the amount of potassium is remarkable, and to a lower degree the magnesium and iodine. The range of its water-soluble vitamins is wide, without any vitamin standing out particularly. The amount of carotene though, is higher than in other fruits, giving the flat peach part of its diet-therapeutic benefits. It has a higher amount of carotenoids, vitamin C and potassium. The provitamin A or beta-carotene is converted into vitamin A in our organism as needed. This vitamin is essential for our eye-sight, the optimum condition of our skin, hair, mucous membranes, and our bones and for the correct function of our immune system, it also has an antioxidant action. The mineral potassium is fundamental for the transmission and generation of the nervous impulse and for a normal muscle activity. It also helps to maintain the water balance inside and outside the cell. Its main component is water. It has a high amount of sugar, fiber and minerals like potassium and tannins with an astringent effect. Their content in vitamins is not remarkable. The mineral Potassium is fundamental for the transmission and generation of the nervous impulse and for a normal muscle activity. It also helps to maintain the water balance inside and outside the cell. Due to its abundance of potassium, its consumption is recommendable for those who take diuretics which eliminate potassium, to cover for the losses. Thanks to their slightly astringent character they are beneficial in case of diarrhea and their soft diuretic effect makes them suitable in case of fluid retention. Its composition is different depending on the variety, but they all have in common their high contents of water. They have high contents of carbon and a low amount of fat and proteins, explaining their high caloric value in comparison to other fruits. As regards the contents of fiber, they contain a moderate amount of soluble pectin. As regards vitamins and minerals, the provitamin A or beta-carotene is outstanding, giving them the characteristic color, as well as the vitamin C and potassium. In a lower degree they contain vitamins of the B group (B1, B2, and B3) and the minerals calcium, phosphorus, iron and sodium. Due to their contents of provitamin A, their consumption is recommendable for anyone, especially for people who have to follow a low fat diet, therefore with a low vitamin A level or those who have a higher need of nutrients. 80% of its content is water and because of a low amount of sugar its calories contents are low. Its amount of antioxidant beta-carotene depends on the intensity of the orange colored pigment of the flesh. Their main minerals are potassium, magnesium and calcium. The vitamin C has an antioxidant action, same as the beta-carotene. 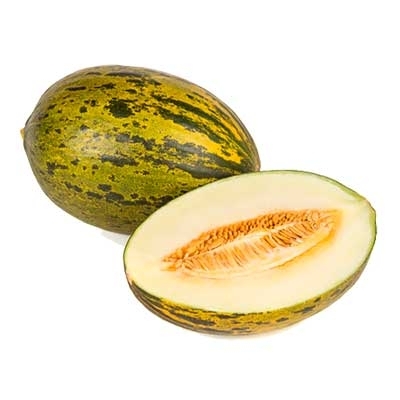 The reticulated melons are different from the rest because they are an excellent source of provitamin A (beta-carotene), vitamin C and carbohydrates. Melons belong to the sodium-richest fresh fruits. Their high content of water turns them into a potent moisturizer. Generally they are very easy to digest, although they can turn hard to digest if eaten directly after lunch. Moreover they are a magnificent diuretic, increasing the production of urine, being recommendable to those who suffer from kidney stones, a higher level of uric acid, high blood pressure or any other diseases coincident with liquid retention. Those watermelon-varieties with pink or red flesh are considered a moderate source of lycopene. Numerous scientific studies have demonstrated that lycopene has antioxidant properties. Therefore by including lycopene rich food in our diet, as, for example, watermelons, reduces the risk of suffering certain types of cancer in general, and particularly pancreas, lung, colon and prostate cancer. Strawberries supply little calories and their main component after water, are carbohydrates (fructose, glucose and xylitol). Their fiber richness is outstanding, improving the intestinal transit. As regards other nutrients and organic compounds, strawberries are a good source of vitamin C and citric acid, salicylic and oxalic acid, potassium and a minor amount of vitamin E, which takes part in the blood cell stability and the fertility. Potassium is fundamental for the transmission and generation of the nervous impulse and for a normal muscle activity. It also helps to maintain the water balance inside and outside the cell. It is a fruit with a very low caloric value due to its low amount of carbohydrates. The main component is water and as regards other nutrients, only potassium is outstanding. Other remarkable components are citric acid (with a disinfectant action it alkalizes the urine and it increases the action of the vitamin C), malic acid, flavonoids (antioxidant pigments) and tannins. The latter ones have an astringent and anti-inflammatory action. Some of the effects of tannins are to dry and reduce the swelling of the intestinal mucosa, which makes them very beneficial when suffering from diarrhea.